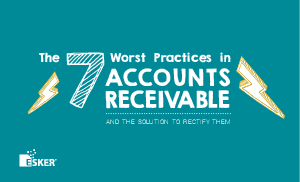 Bad accounts receivable (AR) practices are bad for business. Think your AR department is making all the right moves? It’s easy to find out. Download the interactive eBook 7 Worst Practices in AR to see the root causes of AR performance issues, and how robotic process automation can be your vehicle to the path of invoicing excellence. It’s too important to be awful — see where your AR is going wrong!